It doesn’t get better than this! The house sits directly in front of the main break of Colorados(beach break). Simply walk past our pool onto the sand and paddle into the lineup. Leave someone on the porch to take photos and videos. Depending upon size and tide, you can also walk north to Panga Drops(combo beach/reef break). 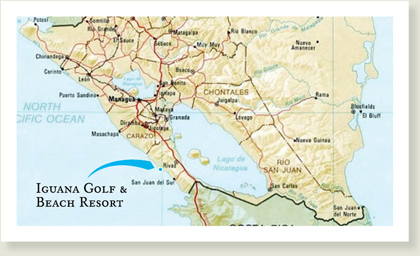 The easiest way to get here is thru our new local international airport, Costa Esmeralda, located behind the house. For as little as $53 you can fly into the airport after a 25 minute flight from either Managua or Liberia. Book it directly with Sansa Airlines or La Costena. From Southern California, the quickest way is Delta direct from Lax to Liberia 12am to 530am and then Sansa to Esmeralda. You can be surfing by 1030am with howling off shore winds for the rest of the day. If you choose to drive, expect the trip to take 2 to 3 hours, depending upon semi trucks, 3 wheel cars, oxen, and other indigenous delays. We can have a driver pick you up that speaks English and can serve as your guide, or you can rent a car from one of many rental agencies at the airport. Rental cars start as low as $5.00 per day believe it or not. Our drivers will generally run $100 to $160 each way and can accommodate large groups with vans. They can also stop along the way for groceries, drinks, and other needs. The road is fully paved now to the community and bad weather is no longer an issue. Once here, there is really no need to leave. We have Surf, Golf, Volleyball, Horseback Riding, Yoga, Fitness Classes, Satori Spa, Markets, Boutique Stores, Surf Shop, Bike Rentals, Community Center, Restaurants, Hiking, Biking, Sand Dunes, Real Estate Center, etc. If that is not enough, then you can leave to go zip-lining, volcano boarding, explore cloud forests, waterfalls, fish, jet ski, explore Ometepe Island-Granada-San Juan Del Sur-Leon-Corn Islands-Apoyo Lagoon, etc. For more information on activities, please visit our management’s website.